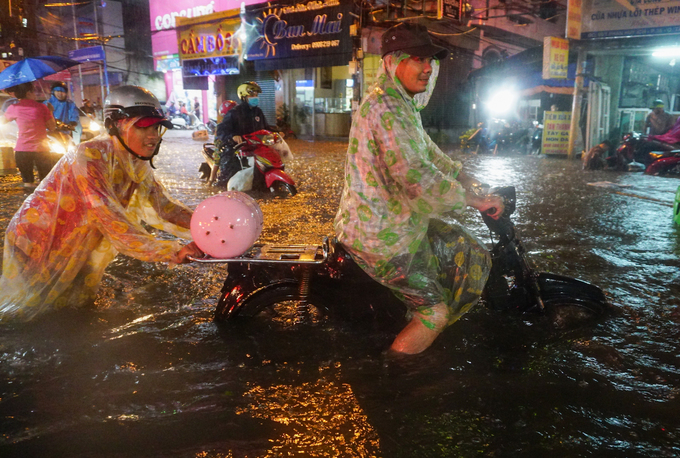 People try to wade through the flooded streets after their motorbikes’ engines died due to rainwater. 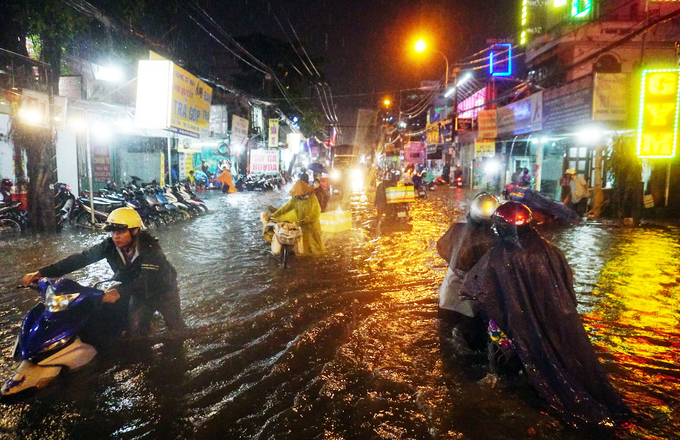 Many of the city’s roads were severely flooded, bringing traffic to a halt. 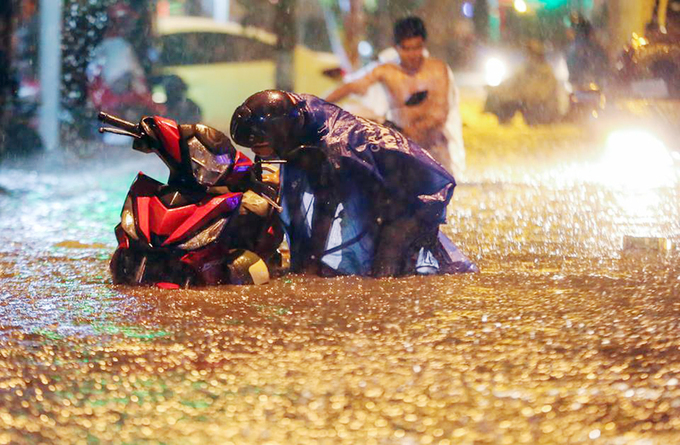 A person tries to push a motorbike through the flooded street. Yen, a local, is seen stranded on a flooded street. 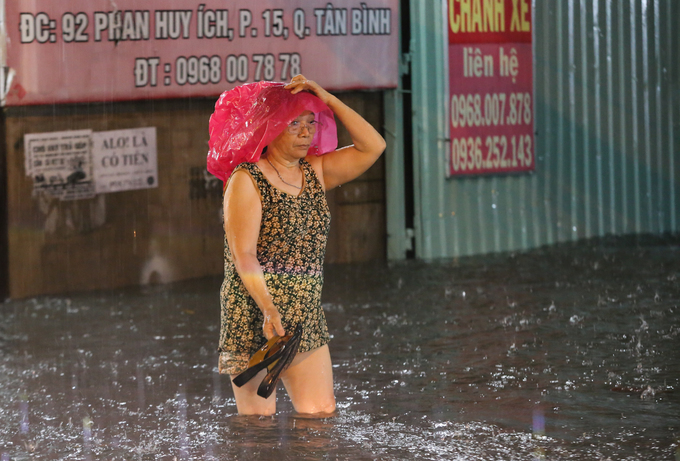 “If it rains for more than half an hour, the water level would be knee-deep everywhere,” she said. 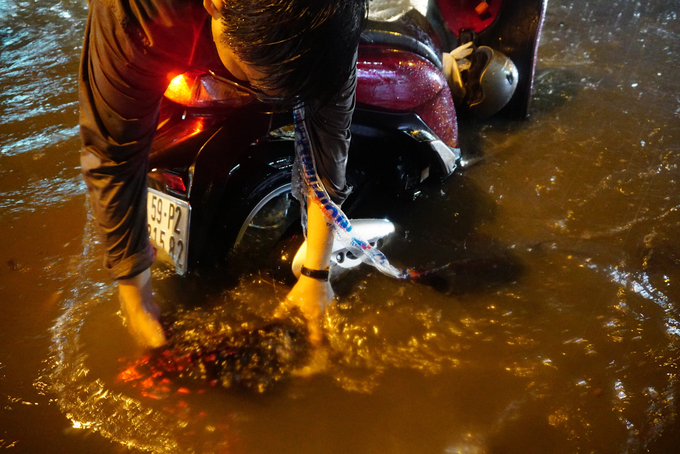 Nguyen Cong checks his motorbike’s condition after its engine died due to rainwater. “The engine’s dead and all the streets are flooded anyway; I might as well park it here,” he said. 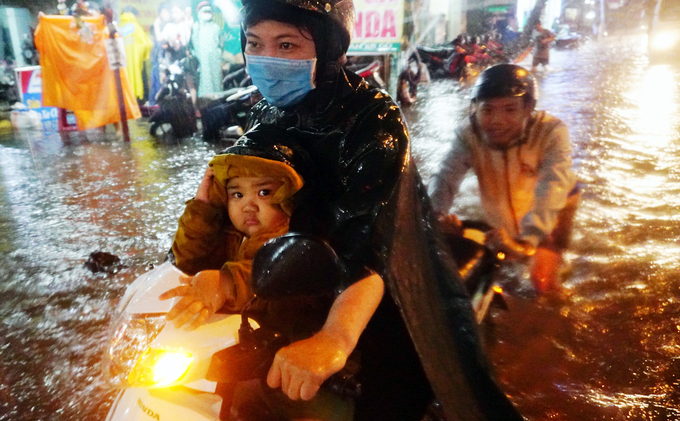 A woman and her child walk their motorbike back home amidst the pouring rain. “I’ve been walking my motorbike for half an hour and we’re still not home yet,” she said. A carriage struggles to wade through the flooded street. A person tries to remove a nylon bag stuck in his motorbike’s wheel. Motorbikes are seen knocked down after a passing car sent big waves across the streets. 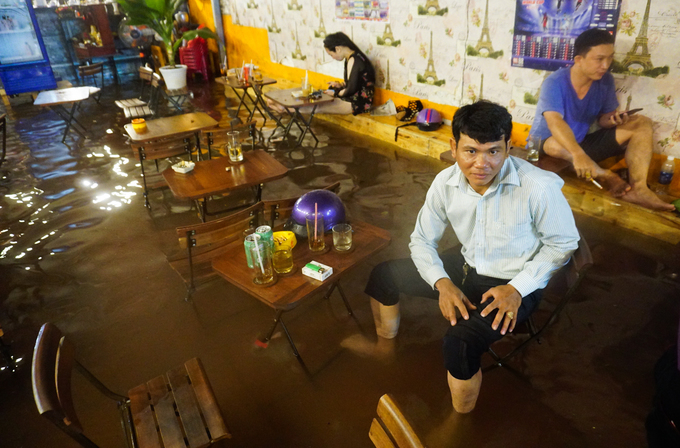 Customers keep calm and carry on at a café near Phan Huy Ich Street in Go Vap District where water is knee-deep. Two people brave the elements under the cover of raincoats with smiles on their faces. 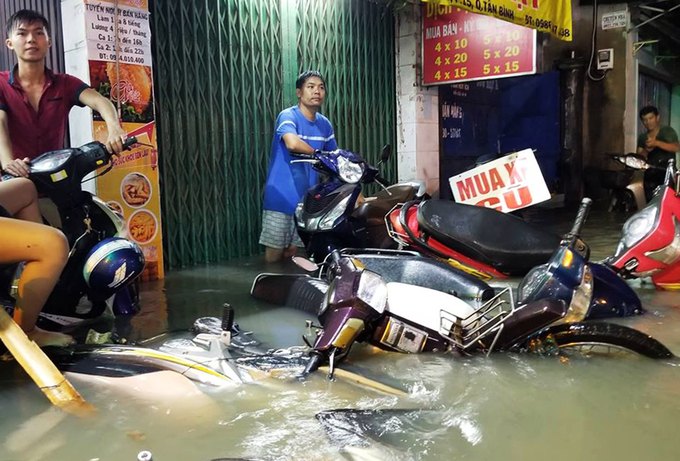 The streets remained flooded two hours after the rain started until 9 p.m. Local authorities said there were about 30 flooded spots in the city, and advised residents to avoid these areas. 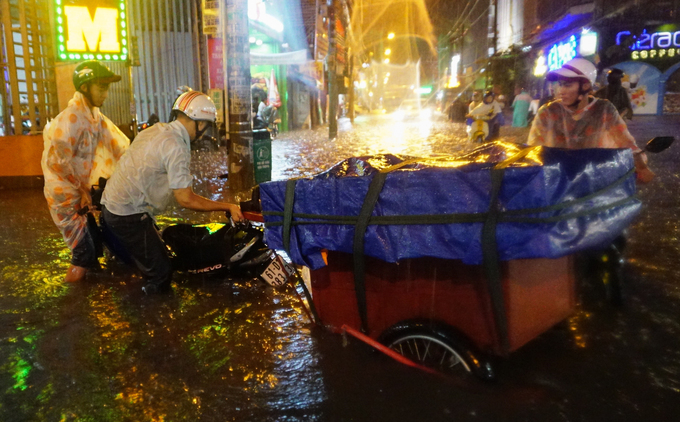 During the monsoon season, usually from May to November, Saigon is a frequent victim to flooding due to the city’s sewage system’s inability to keep up with torrential downpours.